Mass Muslim migration has made it nearly as dangerous to reveal that you are Jewish as it was in the late 1930’s in Germany. For one Jewish teacher in Berlin, it became unbearable. 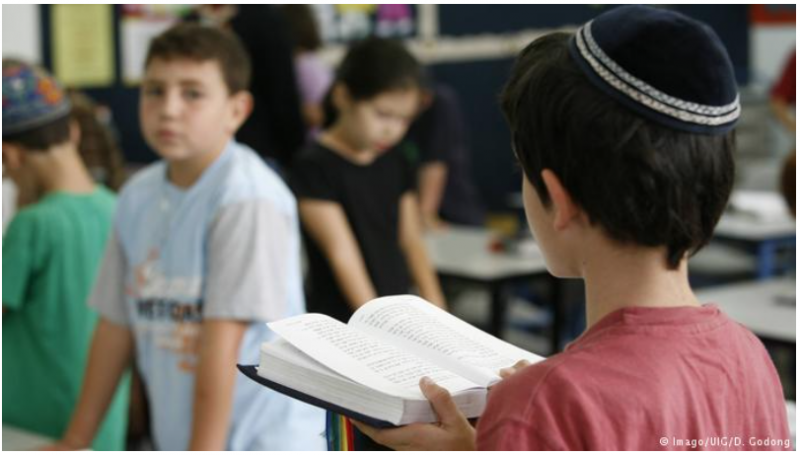 For several Jewish students, it forced them to change schools. CNN Rachel, whose name has been changed because of safety concerns, went to her headmaster, and then to the police, but she said neither took her complaint seriously and would not intervene. She said things got worse. The students saw Israel as a menace, an oppressor of the Palestinian people and viewed her as a stand-in for the Jewish state, she said. They took out their frustration by screaming anti-Semitic slurs at her. Unsure of how to deal with anti-Semitism in the classroom, Jewish teachers very often keep incidents to themselves to avoid tipping off their own religious identity, according to Marina Chernivsky, the head of the Berlin-based organization Kompetenz Zentrum für Pravention und Empowerment (or Competence Center for Prevention and Empowerment), which provides counseling to individual and institutions after anti-Semitic and discriminatory incidents. Teacher Michal Schwartze, who works in Frankfurt, says it took her years to reveal she was Jewish. It took history and politics teacher Michal Schwartze years to reveal her religion to her students. The Frankfurt based 42-year-old said she didn’t feel comfortable teaching about the Holocaust, the Israeli-Palestinian conflict or anti-Semitism in Europe without being transparent with her students. A girl at the Paul-Simmel-Grundschule was reportedly told she deserved to be beaten and killed by a schoolmate when she admitted to being Jewish. 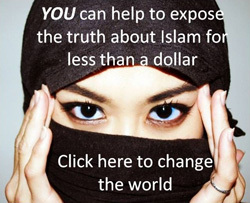 She was accosted by Muslim students because she does not believe in Allah”, her father reported. A few years ago, Schwartze penned an article in her school’s newspaper encouraging students to stop using the word “Jew” as a slur. She said she took a risk writing the piece, but it raised awareness around anti-Semitism at her school. Berlin’s Department of Research and Information on Anti-Semitism (RIAS) said serious incidents affecting Jewish students and teachers in Berlin’s schools doubled in 2017 and the rate is on a similar pace this year. RIAS said most episodes still go unreported. Those that were reported included a 16-year-old girl taunted by classmates who chanted “gas for the Jews.” A 14-year-old boy who was bullied, kicked and shot with an air gun because he was Jewish. And a Jewish student at a prominent international prep school who had cigarette smoke blown in his face while his assailants asked how it felt to be sent to the showers. The abuse caused one teacher in Berlin to address an angry public letter to Chancellor Angela Merkel and other leaders complaining about anti-Semitism in Berlin’s schools. Berlin authorities say they are aware of the problem and acknowledge that the word “Jew” is frequently used as an insult in some of the German capital’s schools. 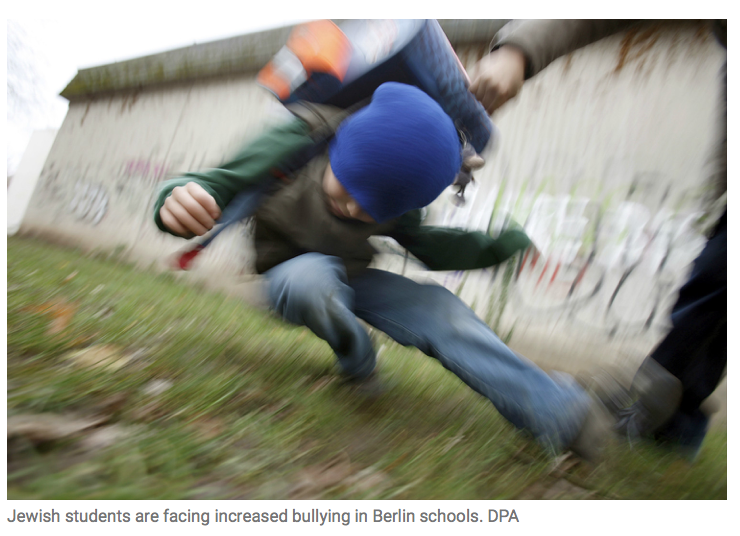 There are no official statistics on anti-Semitic incidents specifically in Berlin schools, although the Research and Information Office on Anti-Semitism in Berlin recorded 470 such incidents generally in Berlin last year. Michalski said his son began attending Friedenauer Gemeinschaftsschule in December 2016. Its motto: “A School Without Racism”. The grandson of a Holocaust survivor, Michalski’s son told his new classmates he was Jewish. Michalski says his son, who was 14 at the time, was smacked on the head and kicked to the point where he developed bruises. Three months into his stint at the school, a fellow student shot him with an air gun while taunting him with anti-Semitic slurs. Michalski said school administrators tried to play it off as “boys will be boys,” and were unwilling to do anything about the incident. He ended up pulling his son out of the school three months after he enrolled. The story of a 14-year-old who had to change schools to escape anti-Semitism made headlines in Germany. 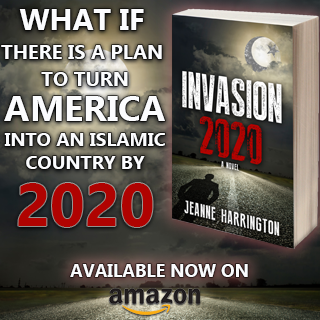 The boy’s tormentors were of Arab and Turkish Muslim descent – making the news even more explosive. 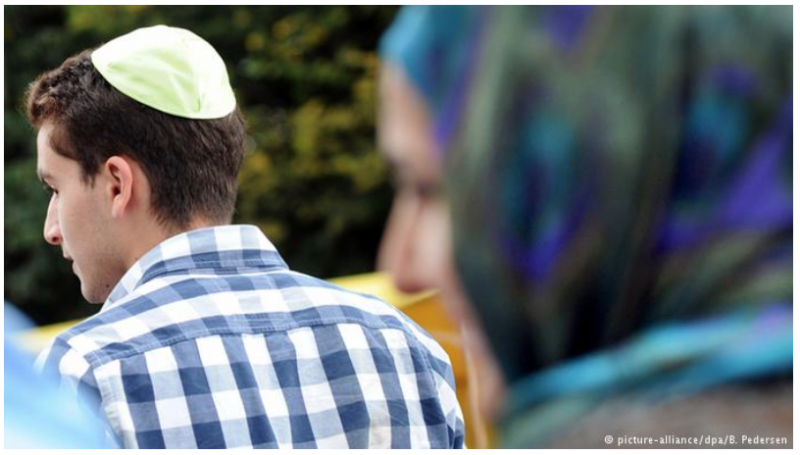 Five years ago, Germany’s Jews would have never considered moving away from the country. During the 1990s and early 2000s, Germany was in the midst of a Jewish revival — the population had grown to over 200,000, and rabbis were ordained in Berlin for the first time since the Holocaust. Now, Rubin said, the question of leaving is being discussed again. Only this time, it isn’t the neo-Nazis who are the threat, it’s the immigrant population, most of whom are Muslims. Florian Mätzschker was one of two Jews at a 1,200-student high school in Berlin’s Wedding district. Last December, he was sitting alone in the school cafeteria when a group of Muslim classmates came up to him and started giving him a hard time about US President Donald Trump moving the US Embassy from Tel Aviv to Jerusalem. He tried to defend Israel’s claim to the city. But as Muslims are fond of saying: “First the Saturday people, then the Sunday people.” German Christian children are being taunted by Muslim immigrant children in the classroom, as well. Career diplomat Felix Klein, 50, was appointed in April to a newly created cabinet-level position: Germany’s anti-Semitism commissioner. He said although anti-Semitic attitudes have long bubbled below the surface in Germany, those views are now exploding into the open. The German government is taking steps to address anti-Semitism in schools. It has dispatched 170 anti-bullying experts to selected schools across the country. Klein said his office is creating a nationwide registry where teachers, administrators, and the general public, can report anti-Semitic incidents. Right now, no such system exists, making it difficult for authorities to understand the scope of the problem. The general attitude among Muslims is that they are superior to non-Muslims. And it gets even worse when Muslim immigrants become the majority of the student population. Even the teachers are intimidated, Jewish or not. Some of that work is already underway. Named after a heavily Muslim neighborhood in Berlin, the Kreuzberg Initiative against anti-Semitism (KIgA) sends teaching guides into more than 40 schools across Germany to help counsel young Muslims at risk of radicalization. One of the goals: encourage dialogue among Muslim students and their Jewish peers. KIgA’s chairman Dervis Hizarci cautions against painting all Muslims as anti-Semitic (Their entire religion is antisemitic). 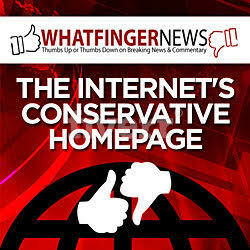 Doing so, he said, further alienates young Muslims who may also be facing discrimination in German society. German high school students learn about the Holocaust in the ninth grade, around the age of 14 or 15. They’re taught about the state-sponsored murder of millions of Jews and they take field trips to nearby concentration camps. A generation ago, teachers lingered on the events of the Third Reich, making sure to present it to students as part of their country’s heritage. A CNN poll found that 40% of young German adults know little to nothing about the Holocaust. German Jews with rose-colored glasses seem to think teaching Muslims about the Holocaust will reduce their hatred of Jews. We, at BNI, know better. ” One of the goals: encourage dialogue among Muslim students and their Jewish peers”. They’ve got some uphill work ahead of them. Jew hatred is written in that demonic text called the Koran. And most muslimes have slush instead of grey matter in their brains. The best way to rid Germany of this new wave of antisemitism is to deport the muslimes that brought it in. Even Murky admitted they contributed to the problem. Problem is we teach our kids to be tolerant and they teach their kids to bully, maim and kill. I don’t even know why public schools exist any longer, especially in these types of situations. It’s completely pointless. Savages should be picking up trash on the roads, then put in cages at night. I couldn’t understand in 2015,2016 why Germany, a country which professed to support Jews and “seemed” to be keen to prevent another holocaust would bring in muslims who create a holocaust/ethnic cleansing wherever they go. If Germany needed workers they could have got Russians and other Eastern Europeans who were much safer and easier to integrate.This suggests the whole mass migration was never about younger workers to replace older workers but about destroying borders and culture for George Soros. If I was paranoid I would think the powerful deliberately did it as a way of “neutralising” the Jews without getting their hands dirty. They knew this was going to happen. I don’t think the Western Leaders want the Jews in Europe. Because the Merkel administration deliberately breached the constitution to create a new enemy within their borders who fits the purpose of keeping ordinary citizens at bay while reestablishing an autocratic political system. They also deliberately allow Muslim organizations, who are just Merkel’s vehicle, to infiltrate and undermine the countries political and legal institutions. What is happening though is that the Muslim Brotherhood organizations, heavily sponsored by Saudi Arabia and Turkey, are about to take over the entire country and convert it into an Islamic hellhole where not only Jews but the indigenous population will be either extinct or driven out of the country. Exactly. It’s never been about labor, hell, 75% of them don’t work anyway. German Jews are so self destructive. They were big on the muslim invasion, now they are big on trying to bring the jew hate they brought to Germany under control. My example; Pamela Geller has fought the jihad so hard. The ADL HATES her and defames her and tries to shut her up. BNI is on the ADL hate list too. Nitz, your mere presence here qualifies you. “Ironic” hardly covers it, huh? The German Jewish council, mainly consisting of leftie do-gooders, betrays their clients in the same way as the Merkel administration does the German citizens in general. And this is why Jewish supporters for the AFD, a party labelled anti-Semitic and racist, is gaining growing support from the real Jewish in the streets running their small businesses. Jewish students can’t get by on brains alone. They have to learn to use their fists, feet, elbows and knees, then teach the bullies, Muslim and otherwise, some painful lessons. Yes, yes, absolutely! The bullied must take matters into their own hands and fight BACK in kind. Crying to this, that or another authority figure that one is being harassed by haters because of one’s “whatever” is a logical response, but it won’t stop the bullying ( in most cases ). If one is unable to retaliate because of a physical handicap, try to get friendlies to do it for you. There must be a counter action to bullying; one can’t just accept it in humiliation. Fight back!